Plan early! If you know when you would like your pool opened this year, you may schedule your appointment now by phone or you may use the form on the CONTACT PAGE to schedule. 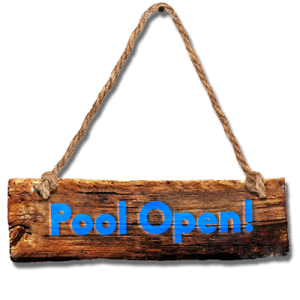 Special Pricing is available only @ time of pool opening. Premium Chemical Package is not part of the Pool Opening price. by testing your water frequently. scaling on pool surfaces and swimmer discomfort. water. The proper range should be between 100 – 150 ppm. away from the pool return. Above ground pools are not designed for diving. Avoid serious injury. DO NOT JUMP OR DIVE! must be backwashed prior to running the filter for the first time. vacuum head into the sides of the pool. Never try to vacuum twigs or heavy debris. These should be scooped out with a net. perfectly flat with a pool base bottom. the pool liner. Unnecessary holes may develop if this precaution is not taken. Eclipse 3 is available from our Pool Service Crews. • The mineral-based natural way to combat algae and bacteria growth. • Eliminates tedious pool maintenance. • Use less chlorine and still have crystal clear water. • Save as much as 50% on pool chemical costs. • Lessens chemical odors, irritation of eyes and eyes or bleaching of hair. • Shock and treat water with chlorine. • Balance water alkalinity between 80-150 ppm. • Maintain pH between 7.2 and 7.8. • Add 2 oz of ECLIPSE 3 per 1000 gallons of water. • After treatment run filter continuously for 48 hours, backwash as needed. • Any sediment collected by ECLIPSE 3 may be vacuumed out. • Add 1/8 oz. of ECLIPSE 3 per 1000 gallons of water weekly. • Always run filter for 8 hours after adding ECLIPSE 3. • Maintain proper chlorine level. measure of the ability of the water to resist changes in ph level. B. The recommended Total Alkalinity (TA) for your pool water is 80 – 120 ppm. can be corrected by adding Alkalinity Down (sodium bisulfate). low alkalinity will raise or loser the TA reading of the water. F. When the Total Alkalinity is within the recommended range, proceed to the next step. • The water may become irritating to pool users. • The pool’s equipment may corrode. If the pH is too low, it can be increased by adding pH INCREASE to the pool water. • Scaling may form on the pool surface and equipment. If the pH is too high, it can decreased by adding pH MINUS to the pool water. for pH. Measurements taken too soon may not be accurate. When the pH is within the recommended range, please refer to the next step. that can cause irritation of your skin and eyes. B. Always maintain the sanitizer level in your pool at the recommended level for each type of sanitizer. Always start with New Test Kit reagents in order to accurately test your water. Be sure your kit tests for alkalinity, pH and (if using chlorine) Free Chlorine or Bromine. Read the labels for dosage application and warning before using any pool chemical. Test and adjust alkalinity to reduce pH drift. Add Total Alkalinity if it’s lower than 100 ppm. Add pH- if it’s higher than 150 ppm. Add a broad spectrum algaecide. Wait for the Free Chlorine level to drop to between 1 & 3 parts per million before swimming. Add daily recommended dose of chlorine. What is it and where should it be? Calcium is the greatest influence on the total hardness context of your swimming pool. Other minerals such as magnesium, iron, manganese, and a few others don’t impact the total hardness enough for us to bother with so we stick with adjusting the calcium hardness. The recommended and best range is between 250 and 350 ppm for your calcium hardness. If the calcium hardness is to low, it can cause problems similar to low total alkalinity in hat it becomes corrosive and try to rob minerals from your pool walls and equipment, particularly the metal. This reaction can cause staining as well. If the calcium hardness is too high, it will cause a scale build up on all of the pool surfaces, cloudy water, irritated eyes, and can reduce the efficiency of your filter. This is also what causes the white ring around the top of your swimming pool. Reducing high calcium hardness is very difficult. The easiest way to do this, although it doesn’t always work, is to replace some of the water with fresh water. If that does not work consult a pool professional, as they will have to add a chemical to keep the calcium solution that prevents it from depositing. Air pillows or so called ‘ice compensators are sold / installed by Long Island Swim-Pool Service without warranty, as they commonly lose air and are without real function. Using an air pillow to make the cover tight (to allow rain water to roll off) can damage the cover and will void the cover warranty. Leaves and water should be removed periodically from the cover to ensure clear water in the spring when the cover is removed. Leaves left on the cover will decay and promote spontaneous growth of algae and spawning of mosquitoes and other insects. And that means GREEN WATER when your pool is opened in the spring! Pool covers tend to degrade with time and exposure to ultra-violet rays and pool chemicals. This is unfortunate but unavoidable. The condition of your pool water in the spring time will also be partially determined by the relative age and condition of your cover. What to do after the winter cover is installed. Water relief is built into this cover by stitching panels together, thereby creating many tiny water vents. As water accumulates on the cover, the material, which is lighter than water, rises slowly to the surface. Therefore, when the cover is dry and first installed on the pool, it is quite common for a few inches of water to seep through these “water vents.” This process is normal and will soon equalize, resulting in a cover that requires much less pumping or siphoning than other covers. Now that the ice and snow are finally going to melt, it is absolutely necessary to drain the water from the top of the cover and to raise the water level in your pool. You may use the discharge hose that you use to drain your cover and put the other end under the cover so you fill the pool at the same time you drain the top of the cover.